We’ve seen various takes on this style of deck before, typically featuring Ancient Tomb and Dimir Signet curving into either Jace, the Mind Sculptor or Tezzeret, Agent of Bolas. This deck is instead leaning on Karn, Scion of Urza and The Antiquities War to both give you a means finding key artifacts, grinding away at opposing disruption, or turning the corner and getting your opponent dead. One of the interesting things about Tezzeret decks has always been that they can utilize both Chalice of the Void and Ensnaring Bridge as a means of disrupting opposing strategies. Given the popularity of Dark Depths strategies in Legacy right now, Ensnaring Bridge in particular is a pretty exciting card to be able to dig for in your maindeck. In games where you can’t just lock your opponent out in the first couple of turns, Baleful Strix and Walking Ballista are haymakers that can take over matchups against linear Delver of Secrets decks, while Thoughtcast ensures that you can keep pace on cards. Topping your curve is Tezzeret, Artifice Master. 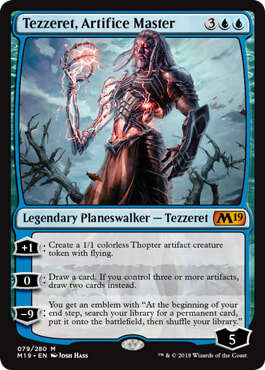 This Tezzeret ensures that you’ll never fall behind in cards against a Jace or Teferi, Hero of Dominaria, and does a great job of pressuring these Planeswalkers even through Terminus. Tezzeret gives you a threat that threatens to end games, even behind an Ensnaring Bridge. This is a different kind of prison deck that ones that we’ve seen recently. You’re not all-in on landing a turn one Blood Moon or Chalice of the Void. You have the ability to have fast, aggressive starts with an early The Antiquities War. You have the ability to lock opponents out with an early Chalice. You can also sit back and grind them out with Thoughtcasts and Planeswalkers. The one thing this deck is a little short on is interaction for combo decks, but that’s where your sideboard comes in. All in all, this is a new spin on a strategy that has been on the fringes of Legacy for many years, and I’m excited to see if it can finally compete with the top tier strategies in the format.